If you call yourself a home cook and you’ve never made a whole chicken, I think it’s time. 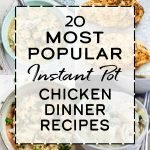 It’s time to experience the deliciousness of home cooked chicken, the way it makes your house smell like Sunday dinner, and the frugalness of homemade chicken broth. 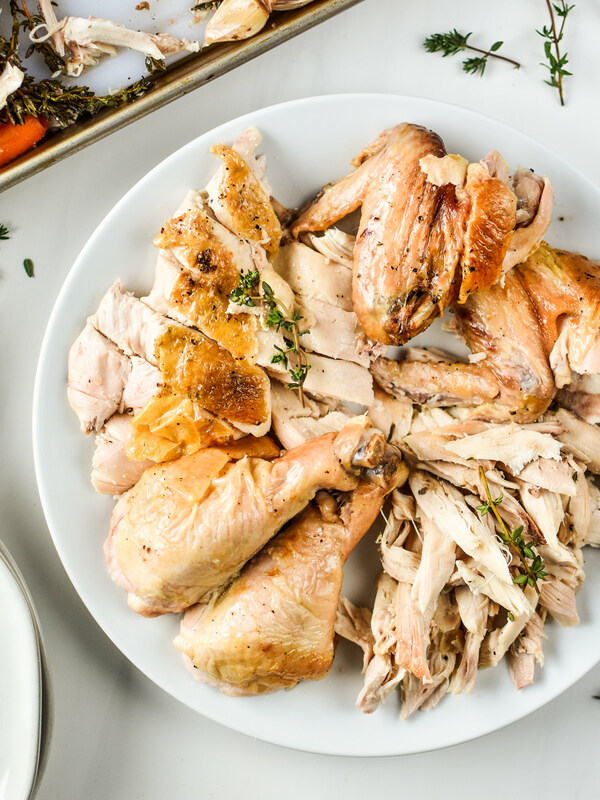 Plus, cooking a whole chicken is basically like cooking a MINI turkey, so you’re getting in some good practice for Turkey Day! I started cooking whole chickens regularly at home over a year ago. 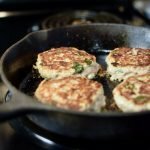 We get one every month in our ButcherBox (affiliate link!) delivery, so it’s become a regular monthly tradition. After practicing month after month for over a year, I feel confident enough to explain the process to someone who has never done it before. Hopefully that’s why you’re here! I’m scared of whole chickens. Where do I start?? Before I ever tried to cook a whole chicken, I actively avoided them. I specifically did not want to cook a whole chicken because I was afraid of ruining it. I didn’t want to touch it. 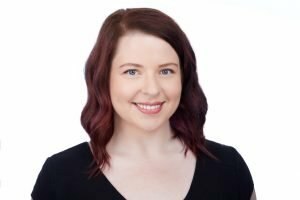 I didn’t want to deal with stuffing the cavity (gross), and most of all, I didn’t know how. How to carve the chicken. How to deal with the leftovers. How to make broth. How to make it taste good. But my oh my was I missing out. I finally convinced myself to give it a try, and now it’s a delicious monthly tradition in our home. Advice #1: The first time you make a whole chicken, do it on a Sunday, or a day when you have the entire afternoon/evening to devote to cooking. No, it won’t actually take that long to make, but it’s best to make a recipe like this when you have nothing else to worry about and you won’t be rushed. 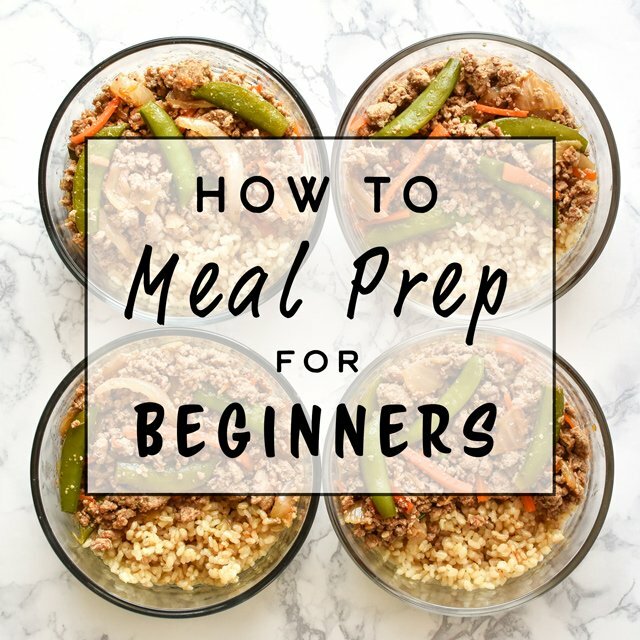 Advice #2: Read the recipe a few times through before you start. 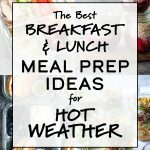 Sounds like boring advice, but it will help you be a bit more comfortable while you’re actually preparing the chicken. Advice #3: Wear gloves if raw chicken freaks you out (but be sure not to spread raw chicken germs anywhere else). Remove and change gloves if you have to touch something other than the chicken. Advice #4: You just gotta try it! The only reason I’m here sharing this recipe now is because one day, I decided to just try making a whole chicken. Then I kept making one every month, and I swear each one got better than the last. I dare you to find me an Ina Garten recipe that doesn’t turn out perfectly every time, I DARE YOU. 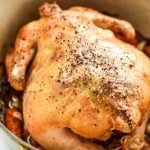 Ina’s recipe was one of the reasons I finally caved and decided to try roasting a whole chicken at home. Other Ina Garten recipes I’d tried were spot on, so I knew I had to trust her with my whole roast chicken instructions. After several months of whole roast chicken tradition, I had referred to Ina Garten’s Perfect Roast Chicken Recipe so many times that I knew it by heart. I made my own tweaks, decided I don’t like fennel, and carried on. But then, we decided to do Whole30, and I knew that slathering a chicken in melted butter wasn’t going to be an option. I tested a roast chicken fully slathered in ghee instead, and success! The same crispy golden skin as the original. I would encourage you to refer to the original recipe if you want to read how Ina does it. 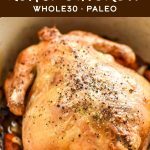 For this recipe, I’ve morphed the original perfect roast chicken into a version that works for Whole30 and paleo diets, and it’s just as delicious! Can you roast a whole chicken with ghee? This was a question I also needed to know the answer to for my Whole30 purposes. So what did I do? Tried it out myself. All my other ghee/butter swaps worked perfectly, so couldn’t see why this one wouldn’t work. Answer: YES, you can 100% swap ghee for butter from the original recipe. The skin was just as crispy, golden brown, and the chicken was perfectly juicy and delicious. 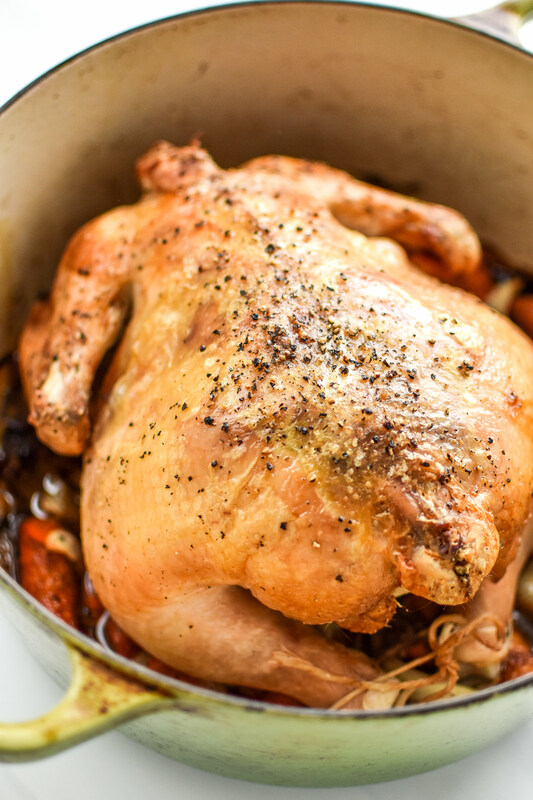 How do you cook a simple whole roast chicken? Let’s break this down into five parts. This makes it easier to think about the ingredients required and actions performed in each part. #1: Initial chicken preparation: In this first phase, you’re going to take the chicken out of any packaging, remove excess fat and tail feathers, then pat the outside of the chicken dry with a paper towel. 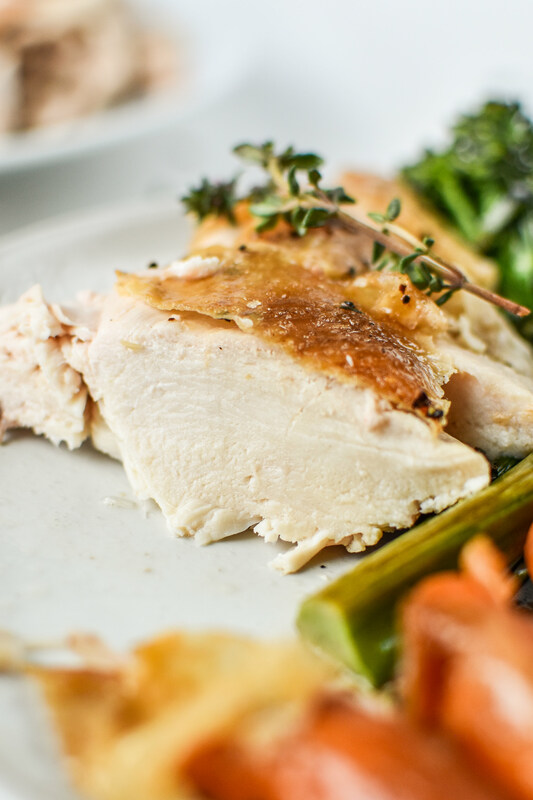 Let the chicken sit on a plate at room temperature while you prepare the roasting pan and vegetables. 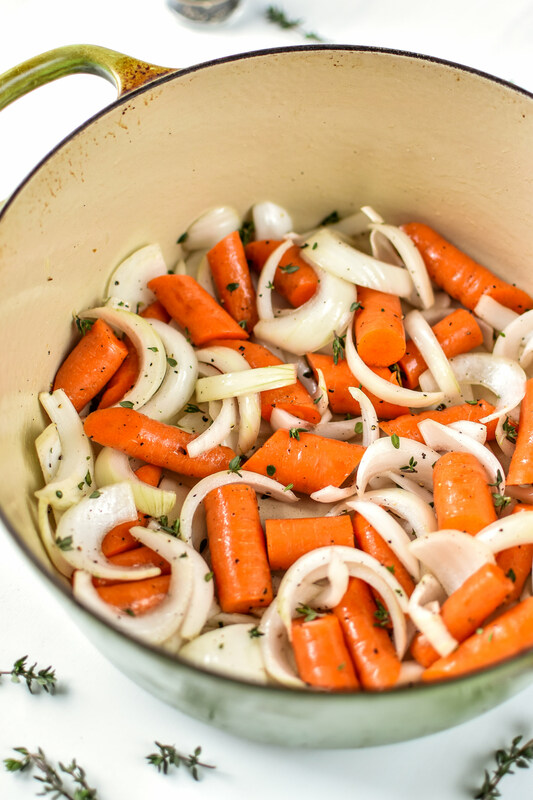 #2: Prepare the roasting pan: This is where I chop up all the veggies I’m using in the recipe, and preheat the oven to 425 degrees F. In a roasting pan or Dutch oven, add carrots, onion, thyme, 1/4 teaspoon each salt & pepper, and avocado oil (Dutch oven is pictured). Toss everything lightly with a wooden spoon or tongs until the veggies are covered in oil and seasoning. 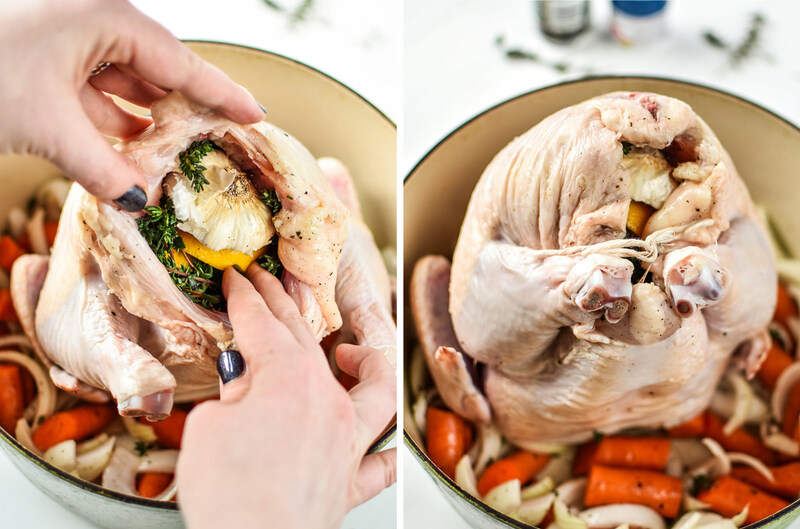 #3: Prep the inside of the chicken: Usually at this step, I’ll place the chicken into the roasting pan or Dutch oven on top of the prepared vegetables to reduce the amount of dishes the raw chicken touches. This step requires a lot of raw chicken touching, so be sure to have your salt and pepper ready so you don’t need two hands to grab them. Hold the chicken cavity open with one hand, and liberally season the inside with salt and pepper using the other hand. 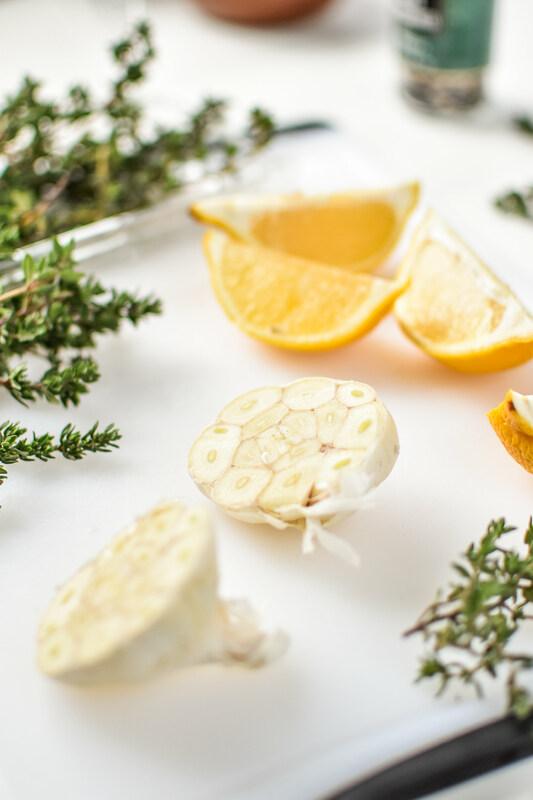 Stuff the cavity, alternating the lemon quarters, halved garlic head, and sprigs of thyme. Tie the legs together with kitchen string and tuck the wings under the body of the chicken (this does not have to be perfect – it’s just to keep the garlic, lemon and thyme stuffed inside). Ensure the chicken is resting on vegetables and is not directly touching the roasting pan when it goes in the oven. 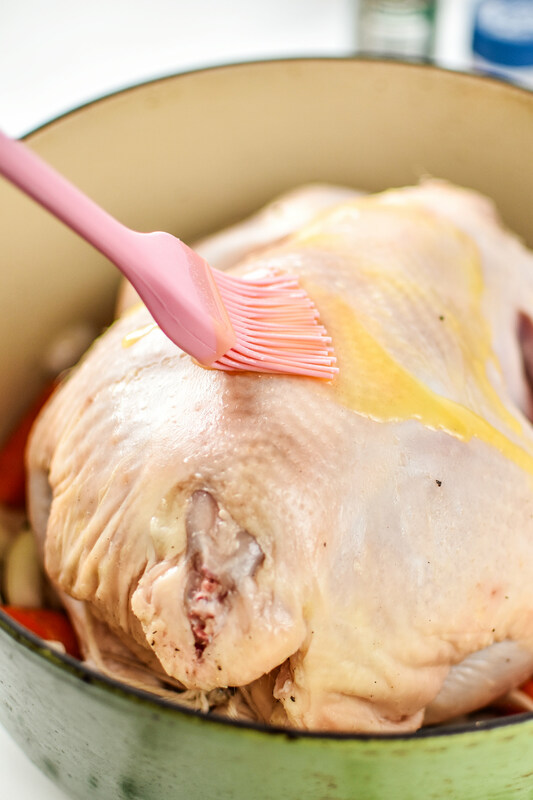 #4: Prep the outside of the chicken: Using your fingers or a pastry brush, coat the outside of the chicken with melted ghee, brushing the top and around all sides of the chicken (except the bottom – no need to move the chicken). Then, season the outside of the chicken liberally with salt and pepper (about 1/2 teaspoon each salt/pepper). There is usually no need to touch the raw chicken during this step unless you need to spread the ghee around with your fingers. #5: Bake, then rest the chicken: Roast the chicken for 60-90 minutes, or until the internal temperature in the thickest part of the chicken is at least 165 degrees F (I usually check two spots to make sure it’s done). The smaller 4.5 pound chickens I get from Butcherbox usually take around 75 minutes to completely roast. Resting the chicken is just as important as the ingredients and cooking method, so please do not skip that step. Remove the chicken and vegetables to a platter and let the chicken rest for at least 15 minutes, uncovered to keep the skin crispy. After 15-20 minutes of resting, slice chicken and serve. If you try to cut the chicken when it’s fresh from the oven, it will not only totally burn your fingers, but all the juicy goodness will run out of the chicken onto your cutting surface. Giving the chicken a chance to rest for 15-20 minutes will let the chicken absorb all the juices for the best flavor and texture. 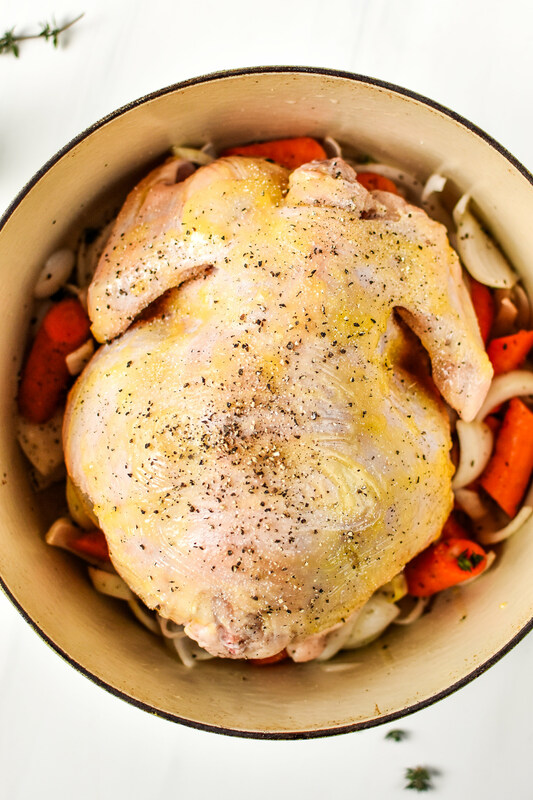 What side dishes go with the Simple Whole Roast Chicken? 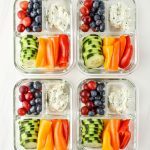 Any simple roasted vegetables would go well with this meal in my opinion. 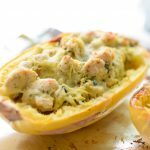 I would include side dishes that are low effort or make-ahead friendly, so you can focus on your whole chicken for your first try! Don’t worry about timing other dishes perfectly on your first time roasting a whole chicken – it can get stressful. 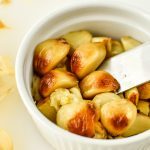 If you have vegetables and you’re curious about roasting them, take a look at this vegetable roasting chart that I reference all the time! 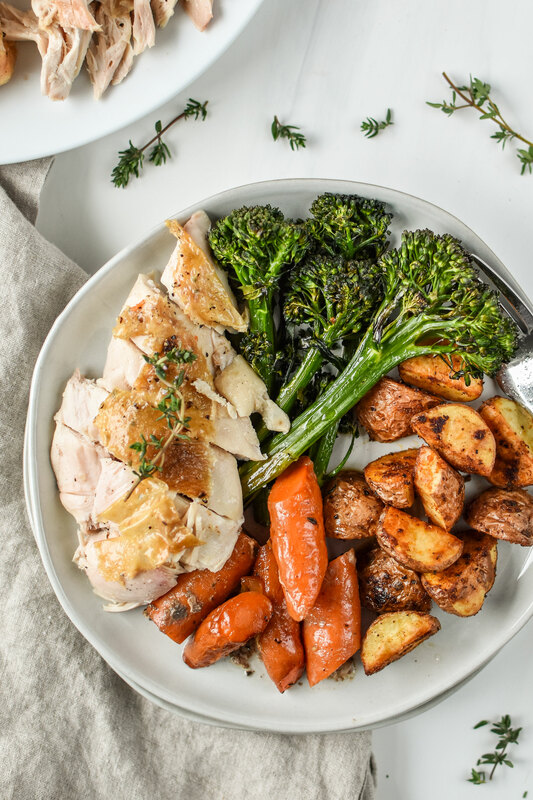 Keep in mind, our oven temperature is stuck at 425 degrees F for roasting the chicken, but most vegetables can easily be roasted at that temperature at the same time. 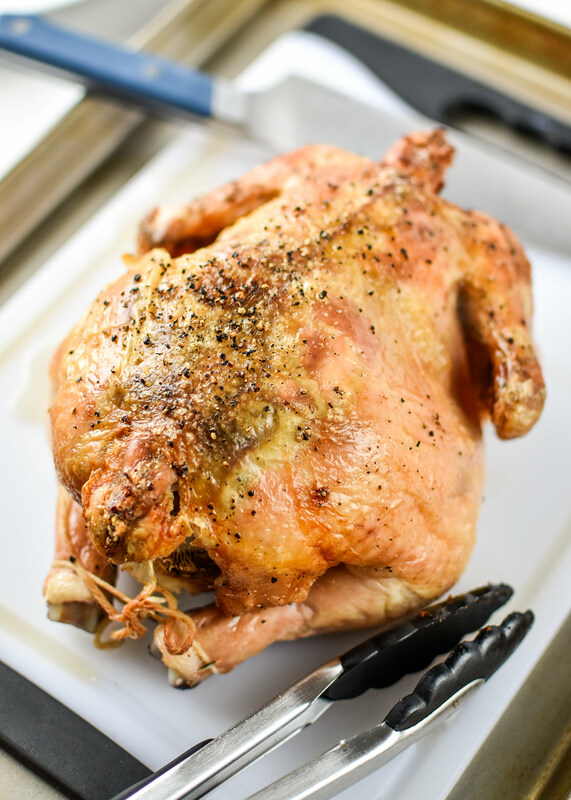 If you enjoyed my recipe for Simple Whole Roast Chicken, please share! I would love to see how your roast chicken turned out and hear any feedback you have. 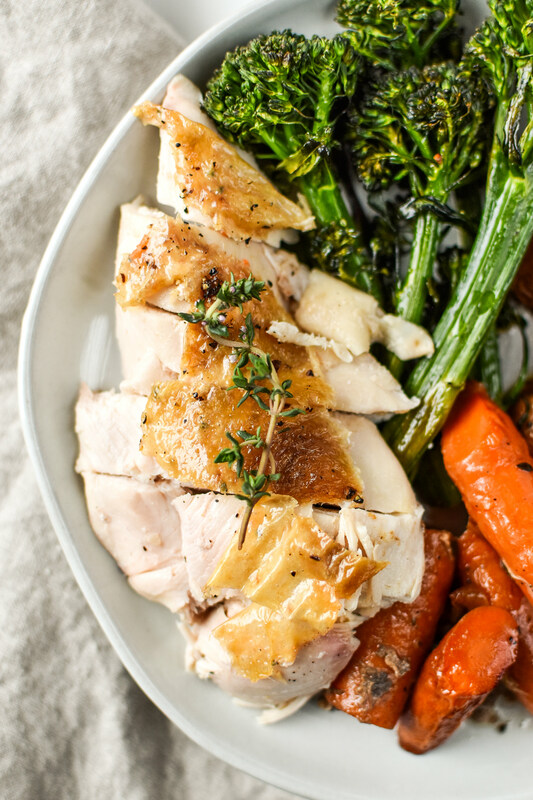 Tag me or use the hashtag #projectmealplan to show me your roast chicken!